The General Data Protection Regulation (GDPR) comes into being and we are now ensuring permissions to hold data by SAMS/Whitby Area Sheds are in place. We are asking Shedders to supply at least one form of contact for them, agreement to receive relevant Shed information (such as the UKMSA Shoulder to Shoulder newsletter), photo permissions etc. All this on one convenient form. We also suggest (optional) that Shedders indicate any healthy conditions that might lead to an emergency whilst they are at the Shed. This might include relevant medications they are on. This can be provided as a note inside a sealed envelope to be opened only in the event of an emergency to assist attending medics. 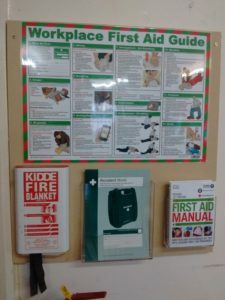 We have obtained H&S/First Aid information for all 3 Shed locations (Littlebeck, Whitby and Staithes). At WHIMS/She Shed this is mounted on a board. We had a prospective new member of WHIMS attend for a sample session. 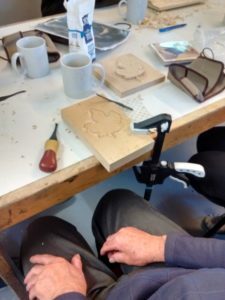 He had a go at carving, something he’d never before done. He enjoyed it and the banter and intends to come again next week.